Women religious from the National Black Sisters Conference entered St. Raymond-St. Leo the Great Church in New Orleans July 30 as part of the Joint Conference with the National Black Catholic Clergy Caucus, the National Black Catholic Seminarians Association, the National Black Sisters Conference and the National Association of Black Catholic Deacons. At the conference, Xavier University of Louisiana announced the formation of a hub for sainthood causes of black Catholics. NEW ORLEANS — Reynold Verret, president of Xavier University of Louisiana, announced July 31 that the university and its Institute for Black Catholic Studies will become the new hub for the advancement of sainthood causes of African-American Catholics. Verret made the announcement in the university’s St. Katharine Drexel chapel. 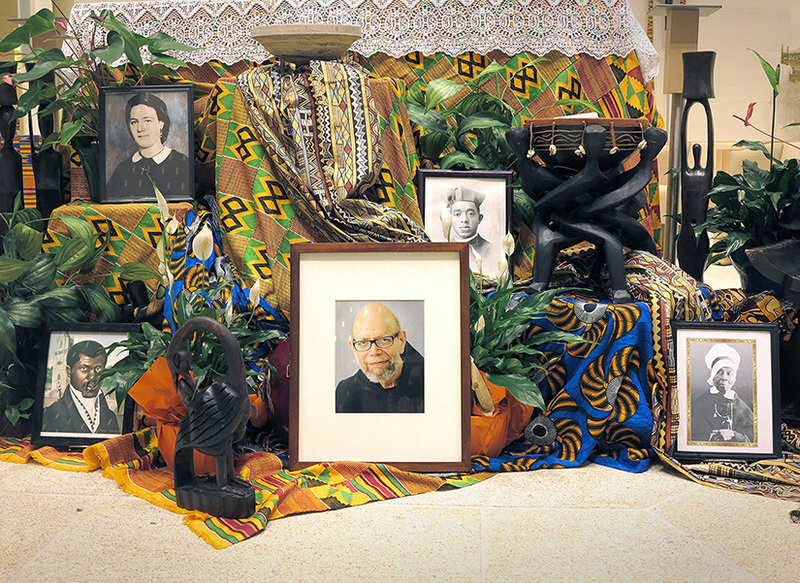 A photo of the late Benedictine Father Cyprian Davis, a renowned chronicler of black Catholic history, is seen July 31 in the center of the altar at St. Katharine Drexel Chapel of Xavier University of Louisiana in New Orleans surrounded by pictures of four candidates for sainthood. Bishop Perry is postulator of the cause of Father Augustus Tolton, the first recognized African-American priest. Father Tolton has the title “servant of God” at this stage in his cause. The center’s initial focus will be on the canonization of Father Tolton and Pierre Toussaint, Mother Henriette Delille, Mother Mary Elizabeth Lange and Julia Greeley, Verret said, with the hopes, this fall, of adding to its efforts the cause of another ground-breaking black Catholic, Sister Thea Bowman, who taught at Xavier’s Institute for Black Catholic Studies. The eventual goal, Verret said, is to establish “a resource center at Xavier with scholarly work on the lives and work” of the African-American sainthood candidates and of St. Kateri Tekakwitha, a Native American canonized in 2012, and St. Katharine Drexel, a white Philadelphia heiress who used her inheritance to found the Sisters of the Blessed Sacrament to minister to African-Americans and Native Americans. • Father Jordan also talked about Father Tolton, a former slave from Missouri whose family used the Underground Railroad to find freedom in Illinois. He trained for the priesthood in Rome because he was refused entrance into American seminaries and was ordained in 1886. He suffered threats while pastoring in his Illinois hometown and moved to Chicago to found St. Monica’s, the city’s first black parish. “His life was a life of courage,” Father Jordan said. The cause for his canonization was proclaimed in 2011. He was named a “servant of God” in 2012. The Vatican Congregation for Saints’ Causes declared affirmatively to the validity of the inquiry into his life in 2015. His remains were exhumed in 2016, and his “positio” was approved so his cause can move forward to the pope. • Sister Magdala Gilbert, an Oblate Sister of Providence, discussed Mother Mary Elizabeth Lange, her order’s founder and a “servant of God.” Sister Gilbert described her “as a no-nonsense woman who did what she had to do.” She worked to educate African-American children when it wasn’t popular: “When you have God at your side, you fear nothing.” Mother Lange’s cause began in 1991 but was recently assigned a new postulator in hopes that the “positio,” or position paper, on her life will be completed this October. • Sister Greta Jupiter, a member of the Sisters of the Holy Family, talked about the cause of Mother Henriette Delille, who founded the order in 1842. She was declared “venerable” in 2010 by Pope Benedict XVI. Two miracles attributed to her intercession are being examined. In general, one authenticated miracle is required for beatification and a second such miracle for canonization. • Mary Leising described the Denver Archdiocese’s progress made on the cause of “Angel of Charity” Julia Greeley of Colorado. Born in Hannibal, Mo., she worked and walked the streets of Denver collecting food, coal, clothing in a little red wagon and delivered the goods at night to the needy. She joined the Secular Franciscan Order in 1901. A guild to research her sainthood was established in 2011. Her cause was opened by Denver Archbishop Samuel J. Aquilla in 2016. On Aug. 10, the archdiocese will close its investigative phase and send its findings to Rome. Father Jordan also said the five candidates were universal saints for everybody, and their causes are “not in competition but in communion” to recognize black Americans who are people of virtue. Blessed Sacrament Sister Eva Marie Lumas, interim director of the Institute for Black Catholic Studies, said Xavier University is a special place that understands the woes and giftedness of the African American community and a perfect place to honor black Catholic ancestors who walked before and contributed much to society and the church. She said elevating these African-Americans to sainthood is “a witness to advancing some who are ordinary people who did extraordinary things, and extraordinary people that understood the frame of reference of ordinary things …” While they might not have seen the fruits of their labors in their lifetime, these candidates for sainthood did what was right anyway by standing tall, walking, talking and showing how to do it right. “It is both appropriate and significant that this joint effort to promote the cause for sainthood for these six extraordinary individuals should originate at Xavier,” Verret said.